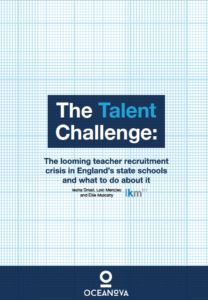 Today we launch our latest report on teacher recruitment and retention, The Talent Challenge. Published with Oceanova it sets out the scale of the challenge ahead and approaches schools could take to help ease the pressure. LKMco Director Loic Menzies sets out the rationale behind the report in the following foreword to the report. You can also read the report’s press release below. Almost two years ago we published “Why Teach?”, our first report on why teachers enter, leave and stay in the profession. Its findings made for at once inspiring and worrying reading. The report simultaneously highlighted the disturbing number of teachers wanting to exit the sector as well as their enormous passion and commitment to the profession. It also set out for the first time the range of motivations that lie behind teachers’ dedication. Whilst some teachers are driven by a passionate desire to transform society, others are more focused on changing individual pupils’ lives. For others it is a desire to pass on a passion for their subject that is key. Perhaps even more importantly, our research showed that teachers’ motivations change over time and that leadership and access to professional development can be crucial in getting the best out of teachers and keeping them engaged. By focusing on talent management, this report picks up from that point. This report sets out the problem that needs solving and then draws together insights from other sectors as well as the research literature to provide new thinking on how schools manage talent. We do not intend to recommend any particular approach, but instead to set out avenues schools and school leaders might want to explore. Different approaches will suit different contexts but the central premise is a universal one: if schools are to succeed in a tough environment, they need to make talent management part of their core business. Ultimately it is teachers who will make the difference in classrooms. However, schools need to back, support and develop them if teachers’ potential is to be unleashed. As this report shows, different sectors have introduced a number of approaches to this. Feedback and dialogue is key, as is understanding and tapping into the evolution of individuals’ career plans. 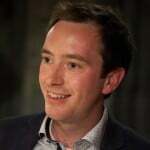 In relation to pupils, Dylan William has argued that schools cannot simply be talent refineries – identifying talent and letting it rise to the top. Instead they need to be talent factories- building and enhancing expertise at every level. Much could be gained if school made this shift in relation to teachers too and I hope this short report will help them do so. A report jointly published by talent management specialist Oceanova and education think tank LKMco calls on the education sector to learn lessons from other sectors on how to solve the recruitment and retention crisis in schools across England. To address this, the report stresses the importance of school leaders developing talent management strategies to stem the recruitment and retention crises, and draws on best practice in other sectors and industries. “The facts around recruitment and retention are well known. Simply carrying on as we are is tantamount to pouring more water into an increasingly leaky bucket. We need to effect a paradigm shift in the way school leaders attract, retain and develop talent within their organisations: in short, they need to become talent managers. “Schools must professionalise their recruitment processes and adapt to the more cost effective strategies and technologies that are now common in other sectors. Financial services, tech, retail – even the NHS – has seen the light and embraced new approaches to recruitment and retention. Understand staff’s need to feel valued and developed. Provide clear development pathways – especially early in staff’s careers and provide mentorship opportunities for staff beyond their Newly Qualified Teacher year. Mentoring is also a powerful tool for staff taking on new roles. Frame organisational goals in terms of staff’s own values and motivations in order to tap into intrinsic motivations. Understand that providing staff with opportunities to substantially affect and direct their own goals, working practices and projects is a powerful motivator. Decouple the accountability and development functions of performance management. Be clear and transparent about what it means to be a high potential member of staff in your school’s specific context. Treat recruitment as an ongoing process by communicating what it has to offer wherever possible, even when you are not officially recruiting.